“Less than two months after voting overwhelmingly to build 370 miles of new fencing along the border with Mexico, the Senate yesterday voted against providing funds to build it,” recent news reported. The alleged 1.8 billion needed to complete the fence could not be allocated without sacrificing many of the other border security measures, like “750 new border-patrol agents and 1,200 new detention beds.” Well, I can’t say I am disappointed by the decision not to fund the security fence, I am concerned though to see where a large chunk of that money has gone instead, that is, the other side of their border security plan - detention beds - hardly a solution for the nation’s immigration problem. But, I must admit, not the least bit surprising. Who’s going to cash in on this, and who is ultimately going to pay the price? Take a guess. I’ve written before about KBR’s contract for future detention facilities, but these new contracts really seem to further institutionalize incarceration as the nation’s preferred model for dealing with anything it cannot control; carceral urbanism as a main staple in our free society's cultural landscape. 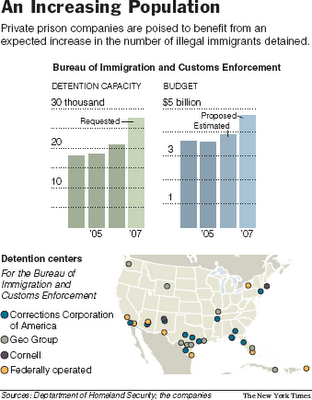 “The Corrections Corporation of America and the Geo Group — the two biggest prison operators — now house a total of fewer than 20 percent of the immigrants in detention. 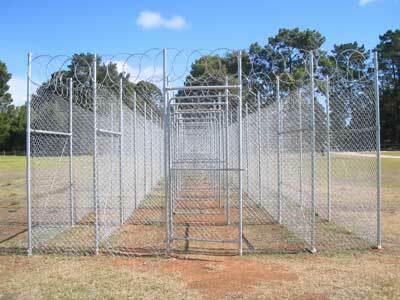 Currently, Corrections Corp. and Geo already run 8 of the 16 federal detention centers through out the nation." Analysts say, profit margins are higher at detention centers than prisons. Just read the Times’s article. 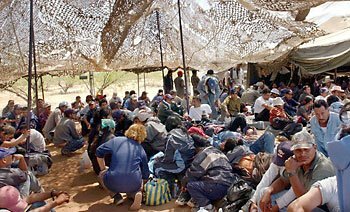 From this recent MSNBC article, “Due to a lack of space in detention facilities, 74% of non-Mexican (150,000 captured a year) illegal immigrants are released. 60% of them never show up for hearings. Those that are detained are kept in facilities that cost $35,000 a year per bed (which now total 20,800). Of course, moves to expedite removal may not work either, the US is still trying to convince China to take back 40,000 nationals here illegally." Putting an end to the “catch an release” tactic of apprehending immigrants and releasing before deporting them, “The government also plans to detain more immigrants, especially those from countries other than Mexico, while they await their hearings.” Yeah, you guessed it, instead of figuring on strategies for strengthening Mexico's economy, the U.S. is going to put those billions into temp-to-perm jails and detention beds instead. Kind of makes one think, if the U.S. secretly welcomes the floods of immigrants so new prison industry moguls can cash in at the expense of the taxpayer, to say the very least. After all, it seems to be an industry with infinite potential. The federal government says it needs around 35,000 more detention beds to hold all of the illegal immigrants that are currently awaiting deportation. As of Dec. 30, there were 544,000 such people who had merely disappeared. Mark Dow also adds, “The reason I use the phrase "immigration prisons" is because we talk a lot about detention. We’re hearing a lot about detention. But when people are detained, they are incarcerated. They are prisoners. They're stripped of their clothing. They’re given inmate uniforms. It's not that they're treated like prisoners, they are prisoners. So even though this is administrative, quote-unquote, “detention,” it has nothing to do with serving time for a sentence. These people are jailed as prisoners, and they are in jails, they are in prisons, and sometimes in what are called detention centers or processing centers, but as a warden once told me, these are all the same thing." Anyway, with all that said, be sure to check out the Camp Campaign project, which explores the phenomoenon of "the camp" (in all it's forms: Gitmo, prisons, labor camps, internment camps, refugee camps, detention camps, etc), and "its relation to other phenomenon we are confronted with in the social and political landscape." 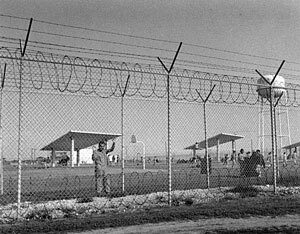 The Camp as "a more acute or extreme version of what is taking place around us in the name of security," in a "state of exception, in this case, the suspension of the rule of law (e.g., Patriot Act, illegal combatants, military tribunals, extraordinary rendition, Guantanamo Bay), have become increasingly common devices of governance, perhaps the norm, in "democratic" states in this last century." Excellent site - thank you for providing such a great resource. I will definitely link to your site from my home page.